New in the shop are these Mini Value Kits! Aren't they sweet? All 8 values are represented with their corresponding value color and each measures a dainty 1 1/2 x 1 1/2 inch square. These cutie pies were part of Riley Blake Designs fabric line "Good Life", designed by Deena. 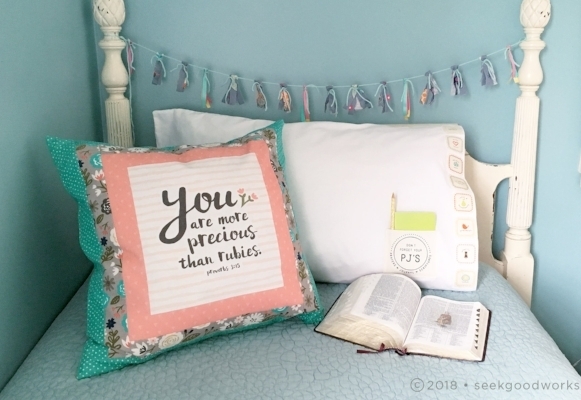 They are perfect for use in a Personal Progress project, decorating your YW classroom, New Beginnings, Girls Camp, or a gift for a special young woman in your life. The kit includes (1) fabric strip with 8 values for $2 and can be purchased in our Etsy Shop. We also have a Large Value Kit, with each value measuring 3 1/2 x 3 1/2 square, and come with bonus ADORABLE assorted "maker" tags for handmade projects. They can be purchased for $5 each. Here is a tutorial on making a pillowcase with our companion "Don't Forget Your PJ'S" which is also sold in the Etsy Shop. If adding the pocket you will also need : 5" x 8 1/2" cotton fabric for pocket, heat transfer vinyl iron-on of "Don't forget your PJ'S"
NOTE: There are many brands of this type of fusible adhesive, but I like to work with Heat n Bond. I used the Feather Lite version because it works best when sewing your project. If you prefer a no-sew option, then you could choose to use the Ultrahold. Using your mini values strip as a guide, cut a matching strip of double-sided fusible adhesive. Fuse together following manufacturer's instructions. Trim each value to desired size. I chose to round the corners of each square, but that is not necessary. Arrange values along the hem of the pillowcase. Following manufacturer's instructions, fuse each value to the pillowcase. Don't forget to place them in order (wink). First, fold pocket fabric in half, wrong sides together, and iron fold to mark top of pocket. Pocket should measure 5" x 4 1/4" when folded. Iron-on the PJ's decal to the center front of pocket. (For detailed instructions on using heat transfer vinyl, see our post on DONT FORGET YOUR PJS. Fold pocket wrong sides together and stitch down each side of pocket with a 1/4" seam allowance. Carefully turn right-side out, being sure to get a sharp point at top corners and then tuck raw edges of pocket bottom to the inside, turning in a 1/4". Pin and press pocket (be sure to protect vinyl logo from direct contact with hot iron). Pin pocket in place on pillowcase, and sew pocket to pillowcase. Here is another cute project using our "Don't forget your PJ's" artwork. This printable is also perfect for young women handouts or to frame and put by your bedside.